We were invited to visit Katie over at Pond Stars in Wimbourne, where we found out what truly makes their company so great, and why people keep recommending their incredible service time and time again. Katie is the administrative magician of the business. Having worked previously as a personal assistant, she has a wealth of knowledge when it comes to all of the technicalities that help things run smoothly. Katie and her husband Gary strike me as a bit of a dream team: Gary being the craftsmen with a passion for designing spectacular water features and Katie the glue that holds it all together. Their showroom is located in rural Wimbourne, within ‘The Old Mill’ compound that hosts several other outdoor related business too. It’s a very inviting and charming place to be. Rather than choosing to be rivals, the businesses on the site all work together, showcasing their products in and amongst those of their very close competition and what a range of products there are. First and foremost Katie and Gary are a family. With a daughter of their own, they fully understand family life and operate a warm and welcoming business because of it. Their daughter took the time to show me around the place, giving me detailed information as to all of the fish that they have, as well as a seriously good knowledge of the materials used to create their impressive ponds. Can you tell us a little about how the company started? Every time we moved, Gary built a new pond. Then he started building them for family members, friends, friends of friends and it just kept growing. He had a real passion for it, so he decided to make a business out of it! I worked as a PA, which helped me to get a grasp on everything and Gary, well what hasn’t he worked as? He’s been a plumber, a bathroom fitter, a plasterer…everything! What makes Pond Stars unique? Our passion. Our passion for making it natural and for doing the best job we possibly can. It’s our passion that shines through. What’s ‘trendy’ in ponds at the moment? It depends, because it is a personal preference. In fact there are lots of factors: personal preference, the house, the landscape and its surroundings. Some people want an ultra modern look and some would prefer a more natural look. We actually have a client coming up in August who has a very modern home and she would like a contemporary, raised stainless steel and glass pond near to the house and then a natural stream deeper into her garden, to fit in with the more rural setting. What’s the most interesting project you’ve ever worked on? Oh there has been so many and all so unique. I don’t think I could say. The best projects are often those where we start completely from scratch, so you can see the full transformation. I expect a lot of readers shy away from ponds, under the impressions that you need tons of space, is that the case? No it’s not the case at all. A water feature can go from something as small as a tub. Just having the sound of running water in your garden is a benefit to your health and wellbeing. It’s always best to look at the behaviour of your fish, to give you a good idea of its all round health. If fish are behaving out of character: jumping, flashing, scraping on the bottom of the pond, or have any unsightly marks it is best to get to the root of the problem, by doing a scrape of three to four fish in the pond, analysing under the microscope and identifying the problem. Which we (or you) can treat accordingly. You mentioned something about an ‘Eco swimming pool’. Can you tell us more? So there are two types: you have a natural swimming pond and a natural swimming pool. The difference is the filtration system. A ‘natural swimming pond’ is run completely with a planting regeneration zone, so you’d have a 50% body of water for swimming in and a 50% regeneration zone, which is then planted with reeds, cattails and various other plants that help with the cleaning of the water. You will still have a pump that helps to keep the water circulating, so you have a moving body of water. Then you have the ‘natural swimming pool’, which looks like a natural body of water, but it is fully cleansed by filter system that has four different chambers. Essentially it’s more natural and chemical free! So unlike a chemically treated pool where you leave feeling pruned and dry, your skin feels nourished by the clean, chlorine-free water. The technology on these filter systems are incredible! In some cases they work to make it cleaner than drinking water – depending on the area you’re in and the condition of water there. You can customise it as you like, to get your desired look. You can dress it with rocks, plants, even tiles if you really want to. Side note, they are stunning! They worked on a particularly stunning natural swimming pond in ‘Portugal’, with a view that looked out over the Algarve. Be sure to check this one out on their website! How does the design process for a new pond, work? Gary will visit the client, sketchbook in hand and they will throw ideas back and forth until they come up with a starting point. Then we have to take the setting into account and consider how the pond will fit in with the surrounding environment. We can provide landscaping if necessary to totally transform their garden into something really special. You say your service comes with its very own dedicated ‘Fish Doctor’, what does that role entail? Fish (like any creatures really) from time to time will fall under the weather. 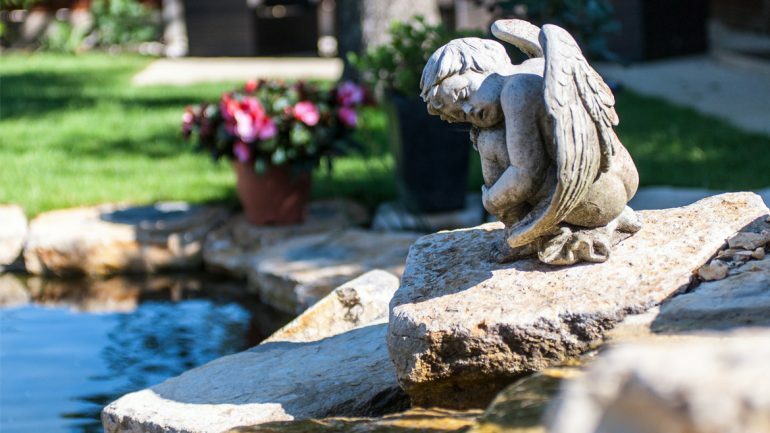 They can get ulcers, little sores, and general bacteria build up on their skin – no matter how clean your pond is. Gary has spent a long time getting to know the kinds of problems that come up and more importantly how to treat them. He is your dedicated ‘Fish Doctor’: he will come and check-up on the wellbeing of the fish to ensure that they are happy and healthy..